Charles Leclerc clinched pole position after topping the times in all three qualifying sessions in what was a faultless Saturday for the Ferrari driver. Ferrari dominated the timesheets and Charles Leclerc set a new lap record of 1:27:866 as the prancing horse’ secured a front row lockout in Bahrain. The Monegasque topped the timing screens in all three qualifying sessions and at the second race of the season, he clinched his first ever pole position in Formula 1. Both Ferrari drivers finished ahead of the Mercedes' of Lewis Hamilton, who starts third behind Sebastian Vettel and over three tenths behind the leader. Ferrari looked dominant in Q1 and set the pace ahead of the silver arrows, with Leclerc heading the timing screens ahead of teammate Vettel. Early in the opening session, McLaren’s Lando Norris was on a flying lap and around the final corner Romain Grosjean impeded the Brit by blocking him. The Haas driver is currently under investigation and could be penalised ahead of the race. Nico Hulkenberg was a shock elimination after finishing the session in 17th place and was out-qualified by his new teammate Daniel Ricciardo who was safely through in 11th place. Alfa Romeo struggled to show their pace in Q1 with Kimi Raikkonen the last driver through to Q2, ahead of his teammate Antonio Giovinazzi who was out in 16th place. Racing Point’s Lance Stroll struggled again in qualifying and was out in Q1 for the sixth successive time, stumbling to 18th place. Williams continued to show their lack of pace with George Russell and Robert Kubica rounding off the grid, with the British rookie edging ahead of his teammate in qualifying for the second race in succession. Vettel’s first lap of the session was hindered by traffic and with his final run of the soft tyres the German improved but couldn’t edge ahead of Leclerc who impressed yet again. Pierre Gasly continued his disappointing start to life at Red Bull by getting knocked out in the second session and the Frenchman will start in 13th place for the race after complaining of a throttle issue. Ricciardo narrowly missed out on Q3 but the Australian will be in a prime position in the race as the Renault driver can start on a tyre of his choice. McLaren and Haas seemed to head the ‘best of the rest’ and both teams saw all two of their drivers into the final session. 39-year-old Raikkonen rounded off the top ten waving the flag for Alfa Romeo as their sole driver in the final qualifying session. Toro Rosso pair Alexander Albon and Daniel Kvyat finished in 12th and 15th respectively with Sergio Perez between them in 14th position. 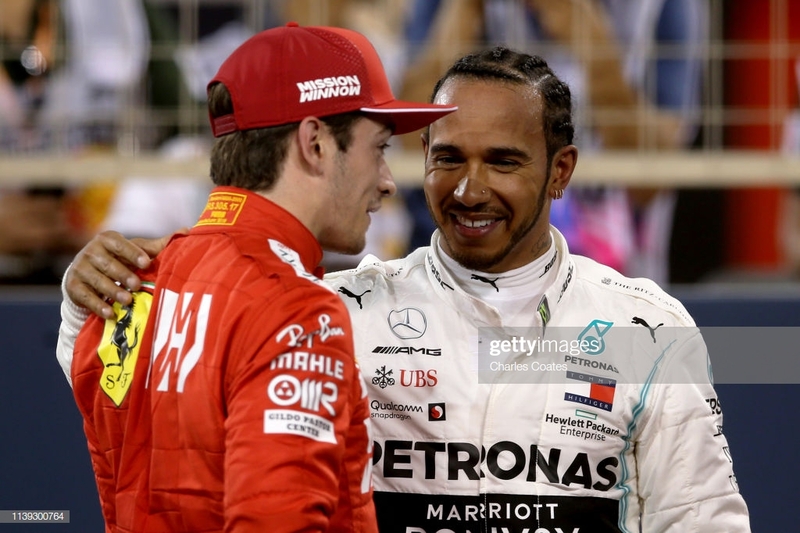 Leclerc continued to show no weakness around Bahrain and capped off a stunning weekend so far, with a pole position start ahead of the race on Sunday. Vettel couldn’t match the pace of his teammate but managed to beat last season’s champion Hamilton who will start in 3rd ahead of Valterri Bottas who clinched victory last time out in Australia. Max Verstappen will start in 5th place ahead of Kevin Magnussen who impressed again, cementing Haas’ place as the leading force in the midfield with teammate Grosjean ending the session in 8th. Carlos Sainz out-qualified his teammate Norris, with the McLaren’s finishing 7th and 10th. Raikkonen starts in 9th place and will hope to be competitive in what will be a closely-run midfield battle.